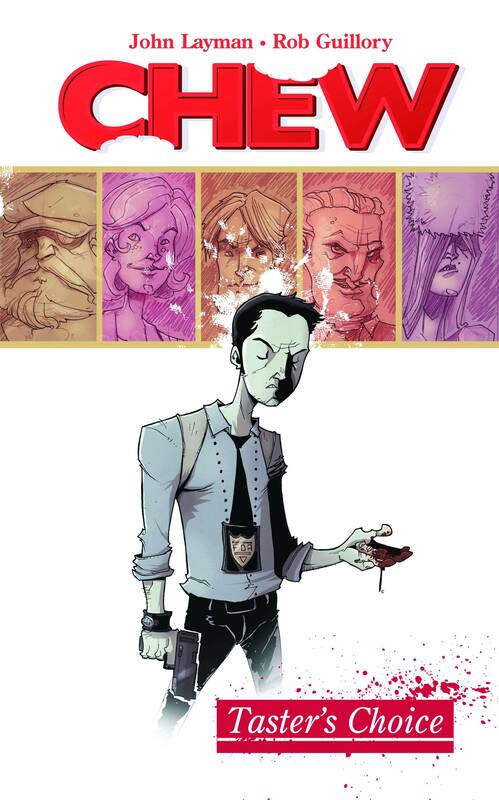 Back in 2009, Image Comics launched Chew, a strange series about an FDA agent with a peculiar talent. The gamble paid off. 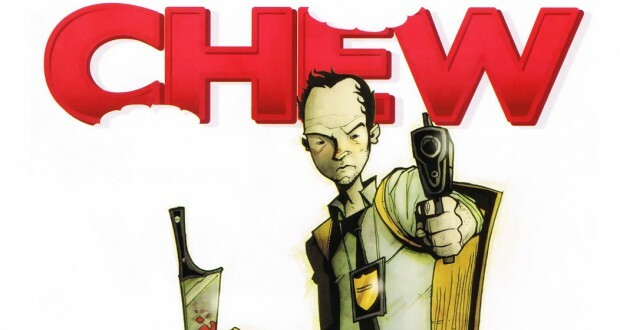 Chew was a commercial hit and managed to win over the critics as well, having won two Eisner awards and two Harvey awards since it first began. The story is thoroughly engaging with an immersive alternative world, complete with a new language developed for the naming of all the food-related powers the various characters possess. 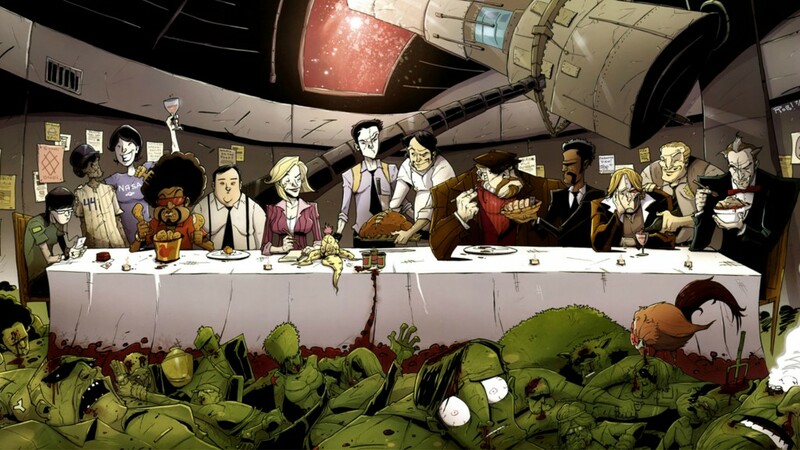 While John Layman’s writing is brilliant, the only piece that lets the series down is co-creator Rob Guillory’s art – but only when it comes to the women in Chew’s world. The series is ongoing, with 9 collected trade paperbacks available as of February 2015. 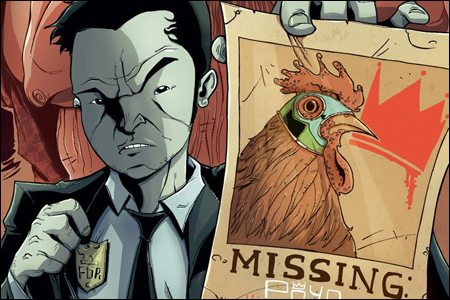 In FDA agent Tony Chu’s world, chicken is illegal. After a bird-flu epidemic killed millions of people and chickens alike, chicken is considered a dangerous substance. But, of course, many people love to eat chicken; there’s nothing quite like eating a succulent chicken breast. The black market is rife with smuggling and con artists trying to pass off questionable substances as real chicken. Tony Chu is a fairly average guy – average looking, average intelligence, with an average job. However, Tony has a remarkable ability – he’s cibopathic. This means that he gains insight into the past/history of whatever he eats, making eating a perilous habit indeed. 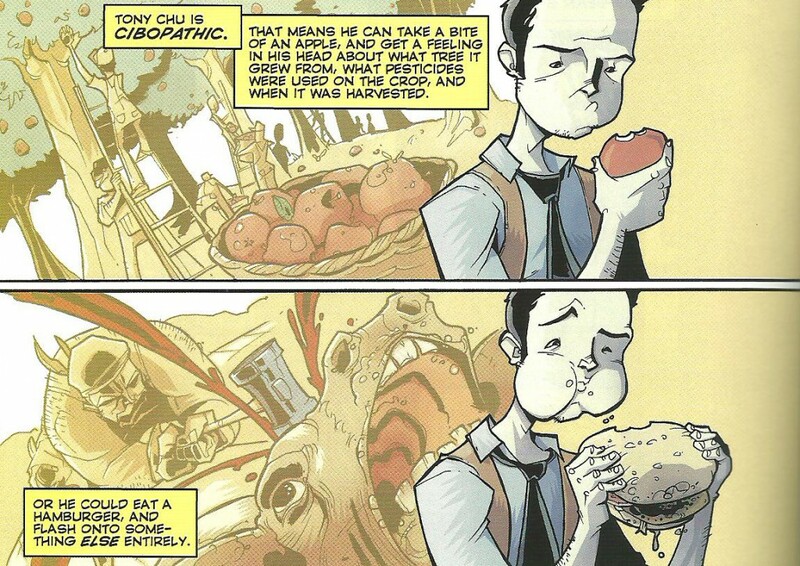 The FDA realizes the benefit of someone with Tony’s abilities and decide to hire him on to eat the evidence. A world post-devastating bird-flu epidemic isn’t exactly difficult to imagine. And for any of my fellow meat eaters out there, a world without chicken is, well, horrifying! This slight change to our ordinary world-scape keeps the story firmly entrenched in what we otherwise know, so that when the food-related abilities are introduced, the reader has more than enough real-world tethers to give them context. The characters within the world and the black market, criminal element that develops as a result of the lack of chicken feels so real it’s a wonder no one has tried it. The criminal who manages to make something so central to most of our diets difficult to come by would be incredibly rich. Adding another layer of realism to Tony Chu is the difficulty he has with his own family – not only are FDA agents universally despised, his own family have no respect for his job either. In fact, his own brother is a world-renowned chicken chef. What’s a struggling FDA agent supposed to do when his own brother is constantly flouting the law? With comic books and other fantasy stories having been around for so long, it’s very rare that any writer is able to come up with an original superpower – or superpowers – as Layman does with Chew. The structuring of the powers, in that they are all somehow related to food, gives a nice consistency to the world. Where other comic book universes involving super powers tend to have no links between the powers of different characters, the powers in Chew all make sense for the world they exist within. The list of food related abilities is impressively long… cibopath, saboscrivner, cibolocutor, voresoph, effervenductor, xocoscalpere, cibovoyant, sabopictor – and that’s just a few of them. The only drawback of all these impressive, imaginative, and original powers is the constant reminders of what each of them involves and which character has which power. While this might have been useful when reading the series as each single issue was released, binge reading through the trade paperbacks makes these constant reminders a little tedious. While the series is great fun to read and highly addictive, I do have one bone to pick: Guillory’s depiction of women. Most of the women in Tony Chu’s world have enormous breasts, tiny waists, and big hips/seductive rumps. They also enjoy dressing in a way that accentuates these features, even when in uniform. Meanwhile, the different body types of the male characters represent a wide spectrum of the population. So why only present a male fantasy version of women in this world? Sure, there’s Tony’s frumpy sister, but otherwise, they are voluptuous and impossibly proportioned. Verdict: Well worth a read. There’s enough issues published now to really invest in a great story with a long run. It’s time to learn what food can really do!